I love the haiku, and the styling of the image. Hehe…you have company here. I also have never seen a cherry blossom in real life, or even an apple blossom, for that matter. Still I think it’s a beautiful haiku, Melissa, and I like the image a lot! 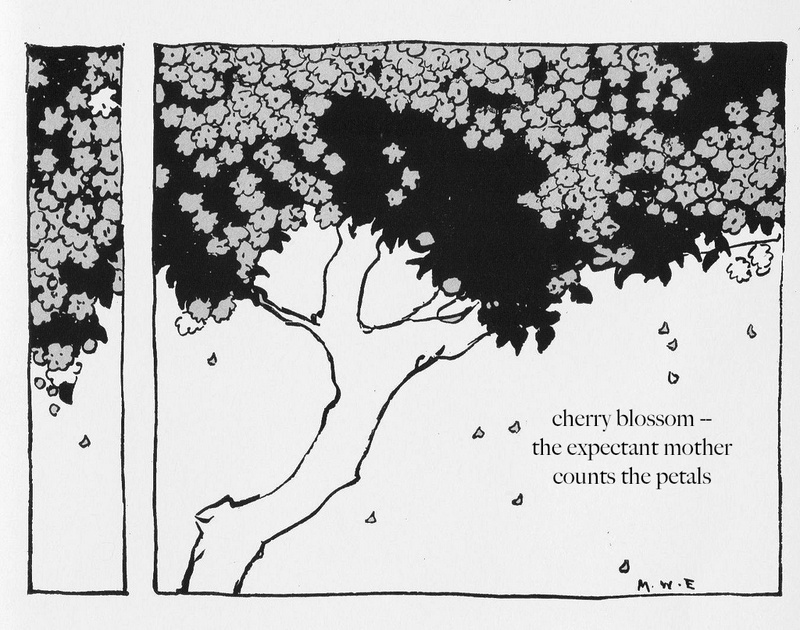 Oh, good, I was starting to think I was the only person in the Haikuverse who’d never seen a cherry blossom. 🙂 Thanks, sanjuktaa. Congratulations, Melissa! I love the haiku. A trip to DC in the spring would solve the problem. Actually the blossoms are very similar, and I think your haiku is accurate. As far as the pregnant state of mind, no comment. Yes, I’m sure there are lots of place I could go to see cherry blossoms… not even as far away as DC. But what fun would it be not to be able to claim to be a haiku poet who’d never seen a cherry blossom? Congratulations! Looking forward to reading soon your apple blossoms! Much deserved, Melissa…this haiku that expands in thought, meaning and universe!!! Each line that comes from you now is a gem. Looking forward to the apple blossoms! First: Congratulations, Melissa. Second: I thought for a while I read my own thoughts reading about your “feeling fake” and abstaining from writing about something you don’t have a feel for or experience with. Something like this happens to me too when I write submissions to publications that may be far from my own writing or sticks to an ideal I really don’t share … maybe that’s why I don’t submit so much these days … I feel like an imposter trying to “fit in” in a slightly dishonest way. Ayayay – the hardships of being a writer … but I salute your decision. Your image caps a charming haiku & congratulations on the HM! An accomplishment of itself. I too entered a haiku, but alas found itself on the cutting room floor. With that said, I am already looking forward to throwing another verse into the spring winds of Vancouver. Best wishes! No apologies necessary, Melissa. Who can argue between apples and oranges . . . or cherries? Your work is what matters. And yours is always delicious. It was refreshing to hear your comments about the haiku, Melissa. They are very valid. I look at your haiku as a “plant the flag” haiku. You plant the flag with a traditional image – cherry blossoms, apple blossoms, first snow, moss on the log, frogs croak, summer breeze, or something familiar. After you plant the flag, you bet the farm on the next image. It needs to pop or reset the natural world with a new slant on life. I think you did that. Counting petals and laboriously counting thru birth options, outcomes, endless possibilities, numerous expectations — it can go on and on. I liked this one.